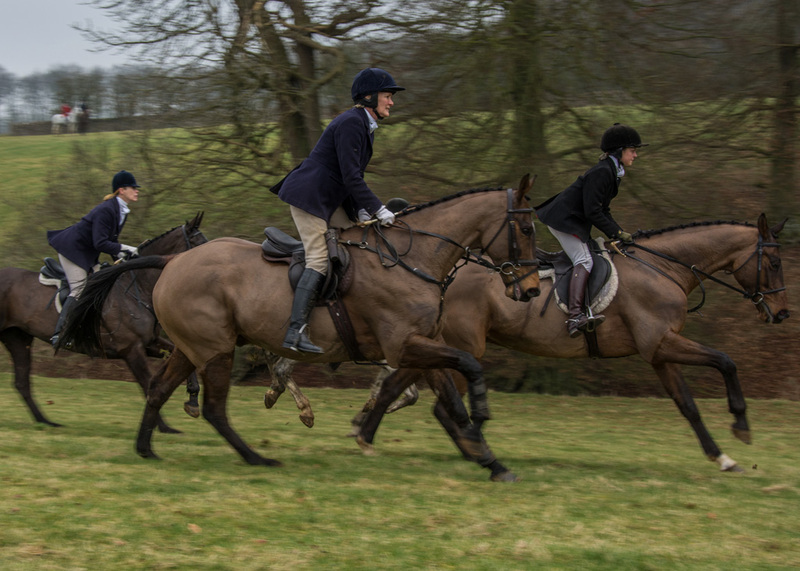 Hacking jacket (tweed, blue or black), riding hat with a black, blue or brown velvet cover, black or brown boots, cream jodhpurs, stock or tie (if wearing tweed) and gloves; body protectors can be worn over jackets. Spurs and garters are also considered ‘correct’ but are optional if your horse is not used spurs. A crop is carried as it has the following practical uses: The hook can be used to open gates, the thong can have a trail-layers cloth tied to it, and it can be dropped down to the side or rear of your horse if hounds are passing by and you do not want them to come close to its legs. A riding mac or wax coat is permitted on very wet days and newcomers, trying hunting, are welcome to wear one. Horses should be clean for the Meet, again out of respect for the host and the tradition we are taking part in. After ‘Opening Meet’ most people try to plait their horse’s mane and some people like to plait the tail as well and fold it up out of the mud. Tack and saddle cloths and girths should be brown, black or cream. Visitors from another pack are welcome to wear their own jackets with their button and colours. Red coats are worn by gentlemen who have been given their hunt buttons either by this pack or if they are visitors from another pack where the red coat is a tradition. When Red Coats are worn, then white jodhpurs and other traditional items such as mahogany top boots, garters and white gloves should be adopted. Farmers do not wear Red Coats, it is a subtle privilege that they can continue wearing a black coat with the hunt button. Therefore do not always assume that a Red Coat signifies the most important person following! A male farmer wears a black coat and black boots without tops and can have the ribbons of his or her hat down at the back. Other followers should sew them under the rim of the hat. 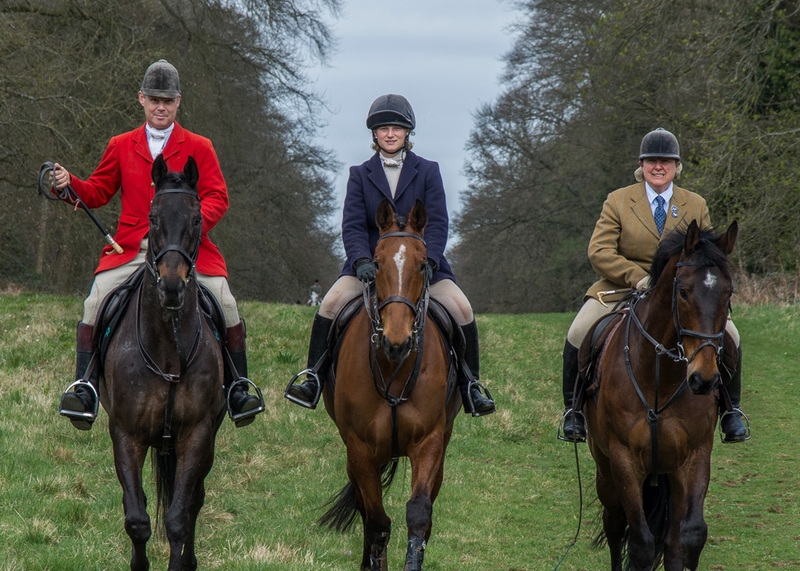 Members will be awarded their hunt buttons by one of the joint masters when they have become regular followers and often are awarded them as a ‘thank you’ for extra help given to the hunt. When awarded your buttons you obtain them from a local stockist, then sew them onto your jacket. Gentlemen may choose to switch to a red-coat when they have been awarded their buttons. The Huntsman and Whipper-in wear black riding hats with bow tails trailing, red coats with five brass VWH buttons, white stock with pin facing North-South and white gloves. White hunting breeches and black boots with mahogany tops and white garter straps with spurs. They wear the same uniform as the Hunt Staff, however their stock pin will run East-West and they will only have four buttons. They wear a black or navy hunting coat, with four brass VWH Hunt buttons, beige breeches and plain black boots with black garter straps and spurs. This hard working, down trodden, timid and unfortunate individual normally wears a red coat with leather money bag over his shoulder. Easily recognisable by the permanent worried expression on his face, looks older than his years and is generally abused by both Masters and members. A top hat (Gentlemen), bowler hat or black or blue riding hat with bow tails sewn up. A plain black hunting coat with three front buttons, a white hunting stock (pin East-West), beige breeches and plain black boots with black garter straps and spurs. Alternatively, Gentlemen may wear a red coat with three front and two rear buttons, white breeches, black boots with mahogany tops, white garter straps and spurs. Black riding hats with bow tails trailing, black coats with three buttons or ratcatcher.